“Places, everyone! 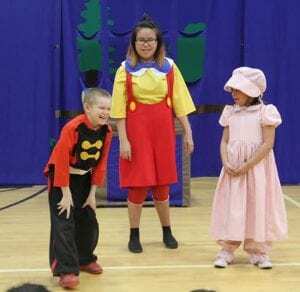 Action!” The Tiospaye Topa School presented Missoula Children’s Theatre production, “Pinochhio” on Friday, March 23. 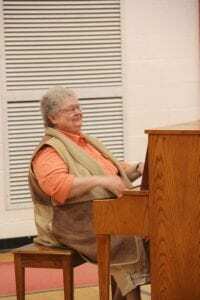 The first showing started at 2:00 p.m. allowing students and staff to the enjoy the play, and second showing was at 5:30 for community members. Students cast in the production ranged from elementary to high school and they spent the entire week practicing their lines, songs, and dance. 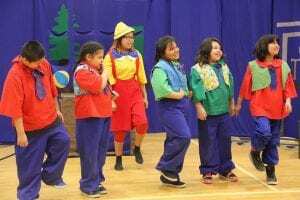 The play is a musical adaptation of the beloved children’s fairy tale, featuring charming songs, dancing skits, and popular characters Geppeto, Jimmy Cricket, Pinnochio, the Blue Fairy, and many delightful toys that come to life. The story begins when Geppeto unknowingly carves a wooden puppet named Pinnochio, out of an enchanted tree. The puppet is brought to life by the Blue Fairy and soon Pinnochio is off on adventures, playing with other toys in the shop and at one point, is swallowed by a giant whale. During Friday’s showings, laughter, cheers, and applause were heard from audience, indicating a success. At the end of the show, the cast and production crew received loud ovations.